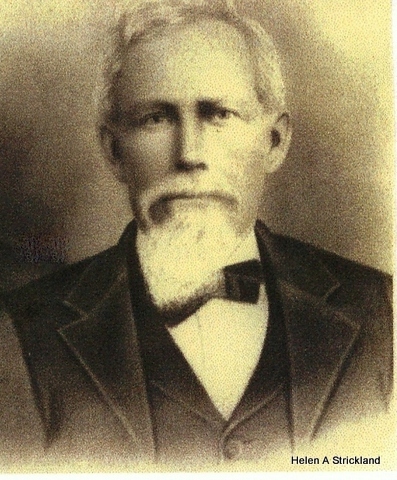 ANDREW SYLVESTER ROBERTS was born on 4 April 1845 in Darlington, South Carolina, the fourth of eight children born to John Manning Roberts and his wife Arcadia Chandler Roberts. In December 1854, Andrew and his family along with many other relatives and friends from the Darlington area traveled by wagon to settle in Sopchoppy, Wakulla County, Florida. On 3 April 1863, Andrew enlisted at Dickerson Bay, Wakulla County, in Company I, 11th Regiment, Florida Infantry. He was discharged on 17 May 1865 at Richmond, Virginia. On 8 April 1867, Andrew married Letitia Holland who was born 22 March 1841 in Leon County, Florida, the daughter of William Thomas Holland and his wife Sarah Jane Barrineau Holland. Andrew and Letitia had nine children. His occupation was farmer. He also had a store in Sopchoppy for a few years and was Sopchoppy postmaster from 1895 to 1900. He was a deacon at the Baptist Church in Sopchoppy for many years. Andrew died on 9 June 1925 in Sopchoppy, Florida. Letitia died on 11 September 1927 in Sopchoppy. They are both buried in West Sopchoppy Cemetery. Andrew has a Confederate marker on his grave.